Pathfinding: Seven Principles for Positive Living – Raskin Resources Production Inc.
Ms. Raskin draws from her own personal experiences, and from the experiences and research of experts who have appeared on her media programs, to inspire and motivate readers to turn everyday obstacles and challenges into opportunities and solutions through the introduction of the seven principles to living a happy healthy lifestyle. See Miracles in Everyday Life. Since I wrote the first edition of this book six years ago, life has changed for me. I went through a very painful divorce and the loss of my dear Mother. Both experiences were life-altering for me and resulted in a true re-evaluation of my own goals and dreams. The passing of my Mother was compounded for my Father, who is now 92. He lost his soul mate, his sweetheart, and his best friend after 62 years of marriage. Needless to say, our entire family felt the sorrow of the passing of a precious loved one who we will miss forever more and only wish that we had just one more day with her to enjoy. Subsequently, I relocated back to my New England roots after 15 years of life by the ocean in North Carolina to be closer to my family. Indeed, life has dramatically changed for all of us. With these major life altering experiences, my own pathfinding has been reawakened and tested. I have had to rely on faith, love, and healing. I must admit that doing the work that I do was and is a true gift and blessing. I found that interviewing experts in the field of human potential, positive psychology, health and spirituality was a lifesaver for me and helped me through the dark periods. I will be forever grateful to all my guest interviews who came into my life when I needed them the most. Through my work and my loving family, I kept hope alive by embracing their warmth and understanding. Today, my “light” shines brighter and brighter…each minute of every day. I’m now convinced more than ever that it is our atttude, thinking, vibration and energy, feeling our pain and forgiving and holding love in our hearts that alows us to not only grow but to soar to great heights in our own beings I have come to realize that it is our relationships, realizing and respecting our connectedness to all things and pursuing our passions that makes life meaningful and joy filled. In this second edition, some stories from the first edition have been replaced with new stories and commentary from more recent guest experts have been added. In Pathfinding: Seven Principles for Positive Living I present the fruits of a daughter’s quest for selfhood and awakening. I include teachings, stories and lessons from important people and events in my life. I explore the importance of understanding the impact our heritage has on our own core beliefs and values. I share how our religious and cultural heritages affect our evolving personality and self-concept. I demonstrate how we can turn self-defeating attitudes and beliefs that we may have adopted during our youth into self-affirming statements of self-worth. Over the past twenty-five years, I have focused on the positive side of living through the television and radio programs I have produced. As a result of my research and interviews with hundreds of people, I have come to some conclusions about positive living and positive people. I believe that we have five basic wants that go beyond food, clothing and shelter, and that balancing these wants is a life long process. The five basic wants are security, both financial and emotional; recognition, both personal and professional; safety; well-being; and peace-of-mind. I believe that external success is achieved through education, hard work and experience and that internal success is achieved through self-acceptance. I feel that people who live positively meet life’s challenges with both internal and external success. 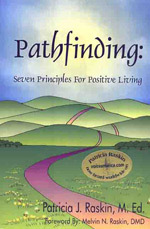 I found my path to positive living from exploring the challenges and lessons associated with my childhood, my own life experience, my career evolution from being a teacher and guidance counselor to media producer and author and from interviews with the extraordinary people who appear on my shows. My mother was the singer and dancer in me, the artistic me, the theatrical me, the show host me. My father was the disciplinarian and nurturer all in one. He brought out the seeker in me and taught me to always do the right thing and stand up for my beliefs. The Ethics of the Fathers states, “It’s not up to you to complete the job, but you must start it.” My father adds, “Don’t say I’ll never be able to finish this. That doesn’t hold. Start it. If you’re building something, you are building it for the next generation.” That’s what I hope to do in this book. Pathfinding is a collection of the insights I’ve gained from my “bee hive” ministry. My positive living and positive people shows are my bee hives. Like the bee that draws nectar from deep inside the flower to make honey, I host positive living shows to draw the positive, life-enriching “nectar” from the life experiences of my guests. My shows become “bee hives” of cross-pollination which transfer my guests’ life experiences into food for thought, so my audiences can turn their own life experiences into a honey comb of strength, hope and positive action. I have persistently and consistently stayed with my vision and production of positive living programs that are inspirational and solution based. Today I produce and host media programs that allow me to be the beekeeper, “buzz through the air waves” to help spread sweetness and to lift people toward positive living in a world which is negative at times. In Pathfinding the major sources of my “nectar” gathering for this book are the wisdom, insights and reflections I’ve gained from my father’s stories, guests on my show, and my own life experiences. As I approach the next bend in my life-long journey, I want to leave a roadside marker for other seekers so they won’t lose their way. This book is that roadside marker. I hope you will use it to take positive steps toward your own life’s work.